A library for Cambridge New Zealand residents was initiated by the Armed Constabulary forces (who were stationed in Cambridge from 1867) and was operated by James Mumford. Unfortunately this arrangement did not continue for long as most of the force was sent to districts where their services were more urgently required. The school and library, housed in the military building in Fort Street closed down. 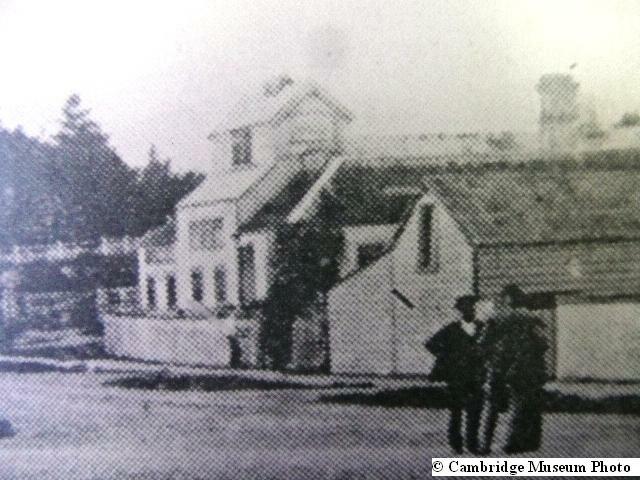 The Cambridge Public Library came into existence in July 1872. It was housed in the new primary school in Duke Street with James Hally as chairman and William Cunningham as secretary – treasurer. There were 30 subscribers and they collected enough money to buy a few hundred volumes ‘all really good and readable works’. Mr James Stuart (the school’s headmaster) acted as honorary librarian. The library was incorporated on 16 July 1879 with William Rout as Chairman and William Willis, Thos Wells, Geo Clark, R C Dyer as Trustees and J S Masters as librarian. 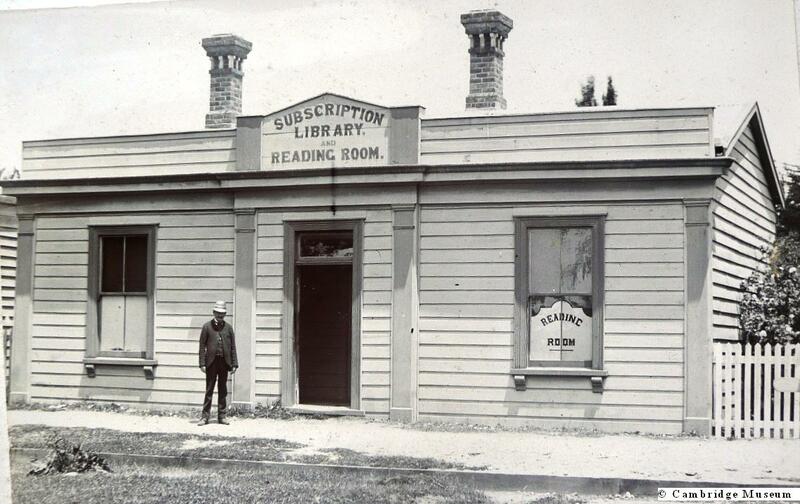 The library moved to a disused immigrant cottage on Victoria Street near the Post Office. A proposal for a new library building was included with the Town Hall plans in 1909 and the mayor, W F Buckland, wrote to Andrew Carnegie asking for a grant of £1000. The Library committee got their nose out of joint and opposed the grant saying they had a nucleus of £76 / 13 / 7d and didn’t need handouts. The grant arrived, the Carnegie Library was built (Information Office today) and the Council took over the running of the Library. 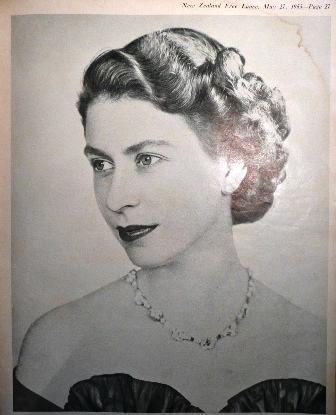 God bless the Royal Queen Elizabeth the Second with long and happy years to reign over us this 11th day of February, 1952. In Cambridge New Zealand several hundred people gathered at the Town Hall steps where the Mayor K L Wilkinson read the Proclamation of Queen Elizabeth II taking on the job of Queen. Some school pupils, Boy Scouts and Girl Guides paraded in front of the steps. Other students were instructed by the Auckland Education Board to stay at school and listen to the radio broadcast from Wellington. It was the first time since the King’s death that flags were flown at full mast. And following the proclamation the Municipal Band struck up the National Anthem and for the first time the populace sang ‘God Save The Queen’. There was not a large attendance at the Town Hall in Leamington where the Town Clerk R S Entwistle read the proclamation. And although the small band sang the National Anthem quietly, they cheered three times for the Queen with great gusto. In 1902 the New Zealand Government provided £ for £ grants to commemorate King Edward’s Coronation. In Cambridge engineer Ashley Hunter, was authorised to arrange with Williams & Grayden to erect the fountain for a sum not exceeding £35. King Edward’s Fountain was built in ‘Cambridge Square’ at the cross roads of Victoria and Dukes Streets. In 1912 it became King Edward’s Memorial. 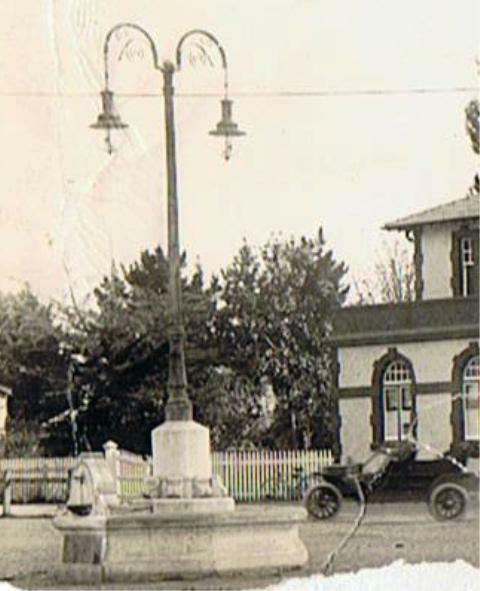 In 1922 there were rumblings to have the fountain removed. A petition, over a yard long, was presented to Cambridge Borough Council signed by 186 citizens in opposition to destroying the King Edward’s Fountain. Sam Lewis (the mayor) wanted to make it clear that there was no slight on any of the people who had been connected with the erection of the fountain but it could not be disputed that the fountain was in the wrong place. Some thought it was a danger to motorists, others thought it helped regulate the traffic. Two days later saw the council workmen on the spot with picks, shovels and a motor lorry and soon there was little or no trace of the obstruction. Was this fountain ahead of its time? Should we have it re erected, on the Victoria- Duke Streets round-a-bout, with memorial plaques to all the Queens and Kings who have reigned over Cambridge New Zealand? After all we are reported to be an ‘English’ town – and what’s more English than the Royals. Empire Street used to be called Brewery Street, because the most prominent business was the Hally brothers’ Brewery, producing vats of pure amber beer and fruit cordials. The stones used in building the two-foot thick walls come from the river below the Fergusson bridge. George Hally arrived in Cambridge via the Thames gold fields and started the brewery, with his brothers James and John, in 1872. After a number of years the business was sold to Mr Edward Cussens then later sold back to Hally Brothers and run only as a cordial factory. Another change of ownership was made and Mr J Amos continued to make cordials until it was finally closed down prior to World War One. Stories were told of occurrences incidental to the process of brewing; of a wild Irishman who elected to bathe in one of the vats and was discovered by an irate manager ‘in liquor’ in every sense of the term; of bumble bees deceived by a similarity of colour becoming well and truly ‘primed’; and of the brewery pigs showing all the manisfestations of having had ‘one over the eight’. In 1903 George Hally led a petition to have the name of the street changed from Brewery to Empire Street.